Say “the king’s great matter”, and everyone thinks “Aha! Henry VIII and Anne Boleyn.” Okay, okay: not EVERYONE. After all, there are peeps out there who have no interest whatsoever in this Tudor king and his determination to rid himself of one wife to wed another. I know: somewhat incomprehensible to us history buffs, but there you are. The world is full of wonderfully diverse people. Now, while the consequence of Henry’s determination were momentous (leading to the break with Rome and the establishment of the Anglican Church) he was not the first king to have a “great matter”. In fact, various kings and other potentates through history have been as determined as Henry was to exchange one wife for another. Take, for example, Jaime I of Aragón, that surprising fruit of the (apparently) unhappy union between Pedro II of Aragon and his wife Maria of Montpellier. 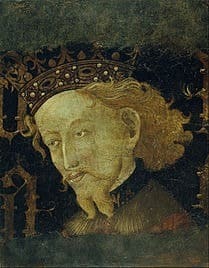 (Pedro was tricked into bedding his wife, hence the assumption theirs was not a happy marriage) Jaime has gone down in history as Jaime el Conquistador, this because he was determined to enlarge his kingdom through conquests, adding, among other things, the Balearic islands to his dominions. 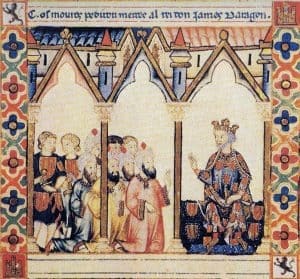 Jaime’s first marriage, to Leonor of Castile in 1221, cannot be defined as either happy or fruitful. They were married when he was fourteen and she was nineteen, he a very young king who had been bandied about between various guardians, including Simon de Montfort (the elder) and the Templars. Nine years later Pope Gregory IX annulled their marriage at Jaime’s request, this due to consanguinity. More likely, the youth had grown into a man and was dissatisfied with the bride chosen for him… By then, Leonor had presented Jaime with a son, and the boy was recognised as legitimate. Leonor was forbidden from wedding again, in return Jaime settled substantial incomes on her and allowed her to raise their son. Jaime, however, set out to find a new wife. He found his new bride in Hungary. In 1235, Jaime married Violant (or Yolande) of Hungary. She was about twenty, he was twenty-eight, a man who was already leaving his mark on the world. Violant was to prove a fertile wife: over fifteen years, she presented her husband with ten children, of which three died young. In between having all these babies, Violant was one of her husband’s trusted advisors. 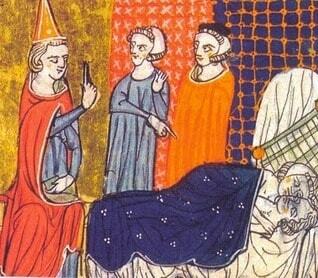 When Violant died in 1251 (some say 1253) Jaime married his long-time mistress, Teresa Gil de Vidaure. Teresa had been a fixture in Jaime’s life since before his marriage to Violant. They had met while he was still married to Eleanor, and the young and very handsome king was most taken by the beautiful and well-educated Teresa. Legend has it that this gorgeous young lady of good birth only agreed to share Jaime’s bed if he promised to marry her. “Cross my heart,” he said, kissing her neck, her breasts, her belly. He never said when he was going to marry her, but I imagine Teresa was very upset when, some years later, he married Violant. And as to Violant, one wonders what she felt about Teresa, who seems to have maintained an off-and-on relationship with her royal lover, despite her being married elsewhere. Her bouts in bed with Jaime resulted in two sons. Teresa and Jaime were married in some sort of civil ceremony that was not blessed by the church. Some historians feel the wordings in the deeds transferring property from Jaime to Teresa rather indicate their relationship was not a marriage. 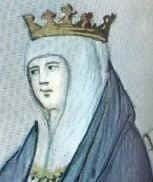 Instead, Teresa was a royal concubine. Hmm. We will come back to this. For a while, things were good. Jaime had their two son legitimised. 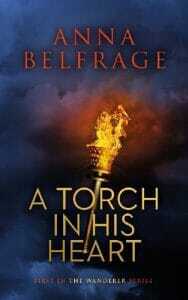 He loved her, she loved him, offering him moments of escape from the strenuous life of a medieval monarch. Maybe he fed her grapes as they lay together in the summer shade. Or she washed his feet while he told her about his latest political concerns. And then, out of nowhere came the fly that was to land in this particular ointment. Allow me to introduce Berenguela Alfonso. Young, pretty, of Castilian royal blood (a minor fault, all things considered). There she came, dancing on light feet towards the middle-aged Jaime and clearly our king could not resist this apparition. Suddenly, Jaime wanted to marry Berenguela instead. Teresa was old in comparison, and besides, he wasn’t really married to her. Not properly. Teresa was incensed. So she turned to the pope, asking for his support. Jaime also wrote to the pope—asking for his support while reminding His Holiness that his relationship with Teresa had never been blessed by the church. Besides, he’d seen a minor blemish on Teresa’s skin and feared she had contracted leprosy, hence his request that he be allowed to look elsewhere for marital bliss. (As an aside, the fact that Jaime felt obliged to contact the pope would indicate that his and Teresa’s union was, in fact, some sort of marriage). The pope ruled on behalf of Teresa—after all, they were both consenting adults and the marriage had been consummated, no matter that it had never been appropriately blessed by the church. 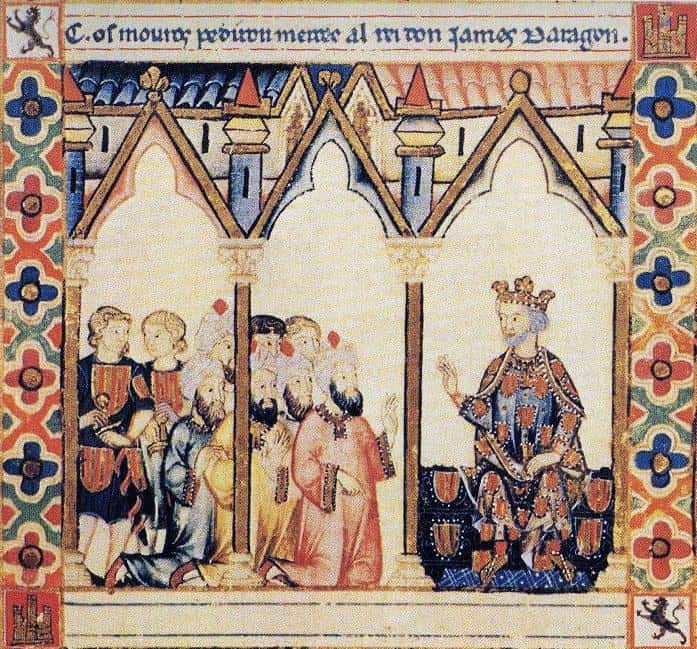 Jaime was most upset with the pope, who not only upheld a marriage he wanted to end but who also took it upon himself to chastise Jaime for his incestuous relationship with Berenguela. (They were distant cousins). He was equally upset with Teresa, who had the temerity of approaching the pope to ask him to confirm a marriage Jaime wanted out of. Now. What to do? he mused, studying the woman he had once loved with less than benign intentions. So what have we here? An older woman who was once the light and joy of her husband. A young and pretty thing, who is rather happy with being the flavour of the month. A brooding and powerful king, determined to have what he wants. Jaime adopted a new approach, informing the pope that he had had carnal knowledge of one of Teresa’s cousins prior to marrying her. This would effectively mean their marriage was invalid, as they’d never requested a papal dispensation due to consanguinity (Teresa’s—with her cousin who had slept with the king. I know: sort of complicated) The pope was unimpressed by Jaime’s new arguments: in the eyes of the Church, Jaime was married to Teresa, full stop. King Jaime was enraged. He blamed his former sweetheart for this whole mess and made it very clear to Teresa that he no longer wanted to see her, talk to her, touch to her. “Get thee to a nunnery!” he likely snarled, and as the king’s word was law the heart-broken Teresa did just that, retiring to live out the rest of her life at the convent of Zaidia de Valencia which she herself had founded. She disappeared behind the walls and was never to see her royal husband again. Did she find solace in this new religious life? We will never know. Jaime adopted an “out of sight, out of mind” approach to Teresa. Once she was gone, it was as if she’d never existed. 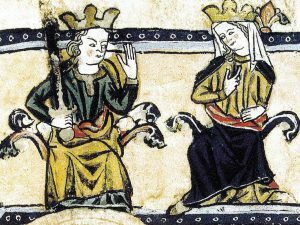 Instead, our conquering king devoted himself to the new love of his life, Berenguela who, however, had to content herself with being a royal mistress. What she thought of all this is unknown. In 1276, Jaime died. Teresa survived him for nine years, dying behind the walls of Zaidia de Valencia in 1285. Just like Catherine of Aragon (and isn’t that just deliciously ironic, that the wife Henry VIII was so determined to rid himself of was nominal queen of Jaime’s former kingdom?) Teresa had the support of the pope. Just like Catherine, she was to experience that didn’t count for much when faced with a vindictive king.